April 11, 2013 Washington, DC – Today, 20 organizations representing immigrant and refugee communities from Cambodia, Laos, Vietnam, Bhutan, and Burma called on Congress to pass immigration reform that unites families and addresses the root causes of inequity and disparity impacting immigrant communities in the United States. 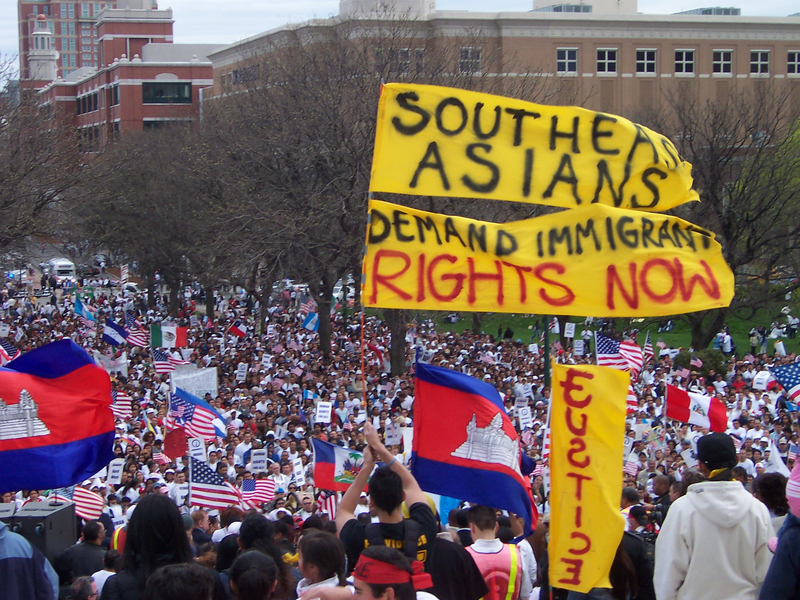 The organizations released a collective statement of principles and legislative stances as a roadmap for Congress to address deportation and other issues important to the Southeast Asian American community. Since 1998, over 13,000 Americans of Cambodian, Laotian and Vietnamese descent have been ordered removed from the United States. In most of these cases, individuals came to the U.S. as infants and young children, fleeing the conflicts in Southeast Asia as refugees with their families. Deportation in these and other immigrant communities soared after 1996, when Congress passed the Antiterrorism and Effective Death Penalty Act (AEDPA) and the Illegal Immigration Reform and Immigrant Responsibility Act (IIRIRA), which made many people subject to mandatory and permanent deportation for prior interactions with the criminal justice and prison systems. The statement acknowledges the war and trauma experienced by Southeast Asian American refugees, and it identifies deportation as an act of violent separation. Additionally, the statement calls for greater investment in education, prioritizes rehabilitation and community healing, and emphasizes keeping families together. The statement also puts forth legislative stances to give judges discretion in all deportation cases, to end retroactive punishment, and to keep families together and allow a fair pathway for reunification. To read the full statement, click here. To sign on as an organization, or for more information, please contact mialiabk@gmail.com or panghoua@searac.org. To sign on in solidarity as an individual, please do so here! We recognize that the root causes of our forced migration are conditions created by destructive U.S. foreign policies and militarism, which led to genocide, war, conflict, trafficking, refugee resettlement, economic and environmental devastation, and the political instability of our home countries. We recognize that the trauma of our experiences and dispassionate social and economic systems have caused severe Post Traumatic Stress Disorder (PTSD) in our communities, and healthcare support structures must be built to address the emotional well-being of our people and families. We recognize there is massive divestment in the education of our young people, and the lack of student-centered approaches to education have led to high rates of push-out in our communities. We recognize that structures of incarceration exacerbate our struggle out of poverty and lead many on a path to criminality, prison, and institutionalized punishment. We believe in Second Chances and our human ability to change. We believe in rehabilitation, redemption, and forgiveness. We prioritize community and victim-led processes of healing over a system of vengeance, institutionalized punishment, and criminalization. We believe in meaningful re-entry services that re-build people and communities. We believe deportation is an act of violence against people, families, and communities. We see the breaking apart of families and the removal of people from our communities as an institutionalized process that threatens the emotional and economic survival of our families and our futures. We believe in the right of ALL families to stay together, regardless of immigration status, family structure, sexual orientation, gender identity, or marital status. We believe that in order to ensure the true security of our communities for generations to come, we need to end practices of political scapegoating, division, labeling, dehumanization, and minimizing of our complex experiences. We believe we need compassionate, representative, and accountable leadership that will advocate for family, dignity, self-determination, equality, fairness, respect, and unified communities. We stand in solidarity with our allies, and support reform that allows for legalization, family reunification, and treating all people humanely. End mandatory deportation and detention. Everyone deserves to tell their story before a judge, and judges should have the right to consider a person’s individual circumstances. Allow individuals with criminal histories to challenge their detention and deportation before a judge, and expand the use of community-based alternatives to detention. Revise the definition of “aggravated felony” under immigration law so that fewer individuals are swept into the deportation process after they have already served their time. Individuals should not be subject to policies that reach back to punish people for incidents that happened before those policies were established. Family is the core of our communities. Immigration policy should prioritize keeping families together, and provide fair and just avenues for reunification, even after deportation has already occurred.